University College Dublin is today officially opening what it says is Ireland’s first purpose-built university law school, following a €25m investment. Designed by Molony O’Beirne architects, the UCD Sutherland School of Law measures over 5,100 square metres and is located on the edge of a newly designed and landscaped lakeside setting on the Belfield campus. 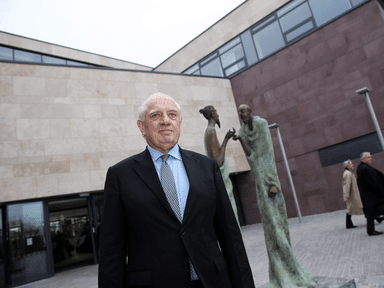 The €25m project was financed from a major leadership gift from Peter Sutherland SC, significant government investment under the National Development Plan 2007 – 2013, and gifts from other leading benefactors, major law firms and private donors. According to UCD, teaching spaces in the new school are designed to promote the active engagement of students with the law. These include a clinical legal education centre where students can develop their advocacy, dispute resolution, client counselling and negotiation skills in simulated courtroom and office settings. The largest theatre in the facility also serves as a ceremonial moot court. “The new school has been designed to further deepen a strong sense of community within a transformative educational environment where staff and students work together and flourish,” said Prof Colin Scott, dean of law at University College Dublin.